For a lot of the western world, December is a month for doing, but also for dreaming. If I could, where would I go? or even I’m going to go. But where? The editors of Lonely Planet, who do a reasonably awesome job of thinking about travel, have beaten us to the this often ci rcular process of thought and are offering up some answers, and all just in time for the holiday gift giving season, 2010. 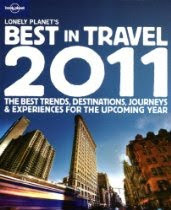 Lonely Planet’s Best in Travel 2011 (Lonely Planet) looks at the top trends and destinations for the coming year. What’s hot (wine and olive tasting in Croatia, for a start) and what’s not? (Gated communities geared at foreign retirees in Panama.) and where are those in the k now going to spend their leisure time in the upcoming year?